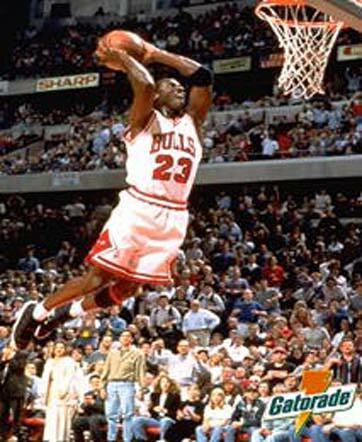 A phenomenal athlete with a unique combination of grace, power, artistry and improvisational ability, Michael Jordan has single-handedly redefined the NBA superstar. The most recognizable athlete in the world, he is not only the top player of his era, but is quite possibly the best player ever to wear the uniform of an NBA team. 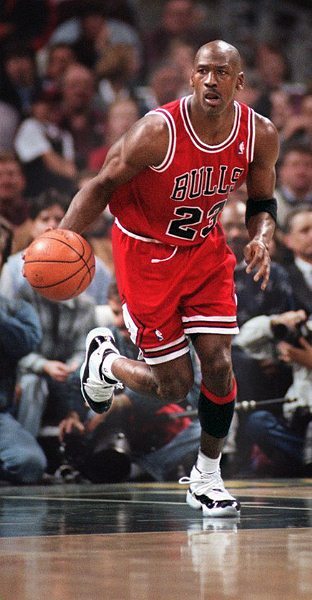 A legend on the court, Jordan added to his mystique with a totally unexpected retirement just before the 1993-94 season. After a year spent playing minor league baseball, he authored yet another amazing chapter to his story by returning to the Chicago Bulls late in the 1994-95 campaign with his basketball skills intact. In 1995-96 he won a record eighth scoring title and led the Bulls to their fourth NBA championship of the 1990s, and in 1996-97 he raised those numbers to nine scoring championships and six NBA crowns in the decade. A summary of Jordan's basketball career inevitably fails to do it justice. The 6-6 Brooklyn native attended high school in Wilmington, North Carolina, where he was cut from the basketball team as a sophomore. He spent his college career at North Carolina, playing for an NCAA Championship team as a freshman and hitting the game-winning shot in the title game. He was named College Player of the Year by The Sporting News in both 1983 and 1984 and won the Naismith and Wooden Awards in 1984. After his junior year he was chosen with the third overall pick in the 1984 NBA Draft by the Chicago Bulls. Jordan burst into the big time with a fabulous first season, earning the NBA Rookie of the Year Award in 1984-85 after averaging 28.2 points per game. An injured foot sidelined him for 64 games in his second campaign, but he came back late in the year to score an NBA playoff-record 63 points in a first-round game against the Boston Celtics. Starting with the 1986-87 season he began a career-long onslaught on the NBA record book. That year saw him average 37.1 points in the first of seven consecutive seasons in which he led the league in scoring (a feat matched only by Wilt Chamberlain) and topped 30 points per contest. By the time he announced his retirement in 1993, he had earned three league MVP Awards, an NBA Defensive Player of the Year selection, a pair of NBA slam-dunk championship titles, seven berths on the All-NBA First Team and six selections to the NBA All-Defensive First Team. He also led the league in steals three times. A nine-time All-Star Game selection, he earned the game's MVP Award in 1988 after a 40-point performance. More than just a scoring machine, Jordan also showed that he was a leader and a winner by guiding Chicago to a trio of NBA Championships. As a rookie, he joined a Bulls team that had won only 28 games the previous season. By 1991 the club had topped 60 wins during the regular season while marching to the first of three consecutive titles. 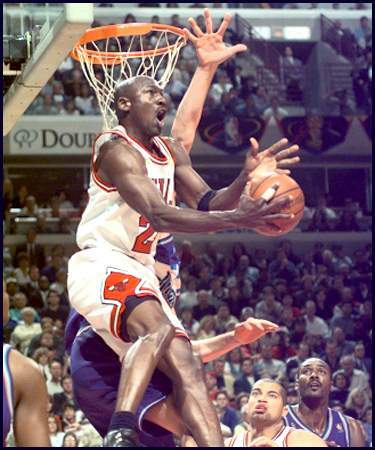 If anything, Jordan was even more spectacular in postseason play. Prior to his retirement he had averaged below 30 points per game in the postseason only once (29.3 ppg in his rookie year). In the 1985-86 postseason he poured in an astounding 43.7 points per contest. He left basketball temporarily in 1993 as a three-time Finals MVP, and he owned a career playoff average of 34.7 points per game, the best in NBA history. He also had two Olympic gold medals to show for his participation on Team USA in 1984 and 1992. Jordan shocked the NBA by announcing his retirement prior to the 1993-94 season. He spent the year playing minor league baseball for the Class AA Birmingham Barons of the Chicago White Sox organization, for whom he was a competent if unspectacular performer. But Jordan's hopes of reaching the major leagues seemed dim, and with Major League Baseball embroiled in a labor dispute as the 1995 season neared, he focused his competitive fire back on the NBA. 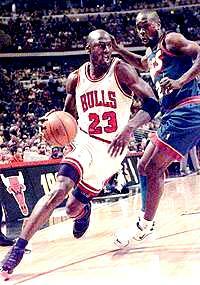 Late in the 1994-95 NBA season he came out of retirement and attempted to carry the Bulls to another title. 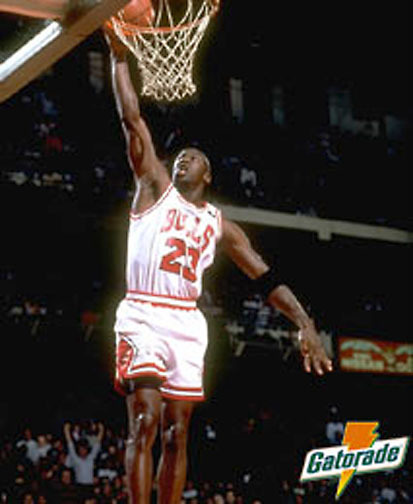 Jordan averaged 26.9 points in 17 regular-season games, then poured in 31.5 points per contest in the playoffs. Despite Jordan's presence in it.